There is some importance to the date of November 1st. In the 1950s’ the small high schools in Indiana that did not play football Nov. 1st was the date set for those schools to open their basketball season. I have and always associate that date with that happenings. In a few days I will attend my first basketball of this season. A small college that plays an NAIA schedule. Ok with me…it is basketball. 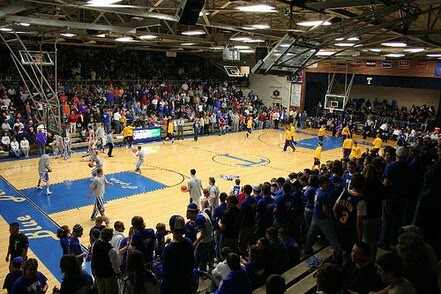 The above picture is of the gym in Frankfort, Indiana. It was built in the early 1960s’. I spent seven years teaching and coaching in that school system. Some of my greatest sports memories took place in that gym. I was fortunate to be a very small part of Coach John Milholland and his teams in 1972 and 73 when they won Indiana high school basketball sectionals. The movie “Blue Chips” was filmed at this gym. 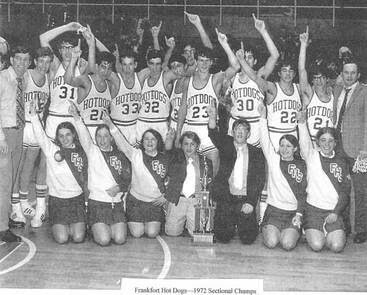 The first team picture is the Frankfort team winning the 1972 Sectionals. 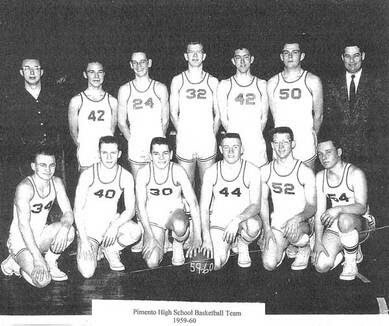 The second team picture–well that goes all the way back to 1960 my senior year in high school. The picture is of the Pimento Peppers that year. No we never won a sectional. Take a close look at #40. In my friend Mike Lunsford’s book “Sidlines”he gives many reason why he likes the the sport of basketball. I feel very much like Mike. “I like to hear kids sing the national anthem before ball games. There’s something strangely reassuring about that. I like coaches who coach, players who work hard, and cheerleaders who truly care about what’s going on in the game. I like it when little kids sit behind the team benches, dreaming, perhaps, that someday they’ll be on it. I like high school bands, full-court presses, and good popcorn. Have you ever held someone or danced with someone who was wearing velvet… she wore blue velvet… precious and warm… a memory… through the years. I was fortunate that I once got to see Paige play. Long after he was out of the major leagues he “barnstormed” (traveling around giving exhibitions) with a team that came through our town. They played a group of local all-stars at Memorial Stadium in Terre Haute, Indiana. Also, some time back I got to spend time with the basketball great Meadowlark Lemon and he shared with me some of the stories during a period of time when he barnstormed with Paige. Let’s just say seeing Paige play on that evening was was more than worth the price of admission. Not too long ago I stood at a recreations baseball field. I watched as a group of kids were getting ready to play an informal choose up game. I had to smile when I saw the last player chosen and then I over heard one kid say to this last chosen one, “you’re in right field.” I thought back…some things never change. You see in the late 1950s’ my dad bought a 1957 Chevrolet. That was one of the most popular cars at the time and today ’57 Chevys are in demand and bring big money. I recently saw one sell for $60,000. Anyway Dad buys this car, I get all excited as I head for the garage to see the car for the first time. Wow…it is a hardtop. Meaning when you rolled all the windows down there were no posts. Full wheels covers. Good. As I slip in the seat behind the wheel there it is “stick on the column.” Meaning it was a stick shift which to a sixteen year old boy was a big yes. Then I look. What? What? It can’t be. It just cannot be. There in the dash where a radio should be was a black panel. What no radio. Yes no radio. I hurry back to the house to share the news with my dad. Surely he has made a mistake, just a slight over site on his part. He is sitting at the kitchen table (a familiar place of his early morning residency) mom has fixed his plate of eggs, bacon, toast and black coffee. A breakfast he must have had a million times in his life. To his right folded one time in the middle is the Terre Haute Star and it is turned to the funnies. I know he is reading one of three. Little Abner, Alley Oopy or Dagwood. “Dad, hey Dad,” he looks up. The car, the car it doesn’t have a radio. Now why my beginning reference to a transistor radio. I did negotiate with my dad to buy (I paid $29.95) a transistor radio and carry it with me in the car. 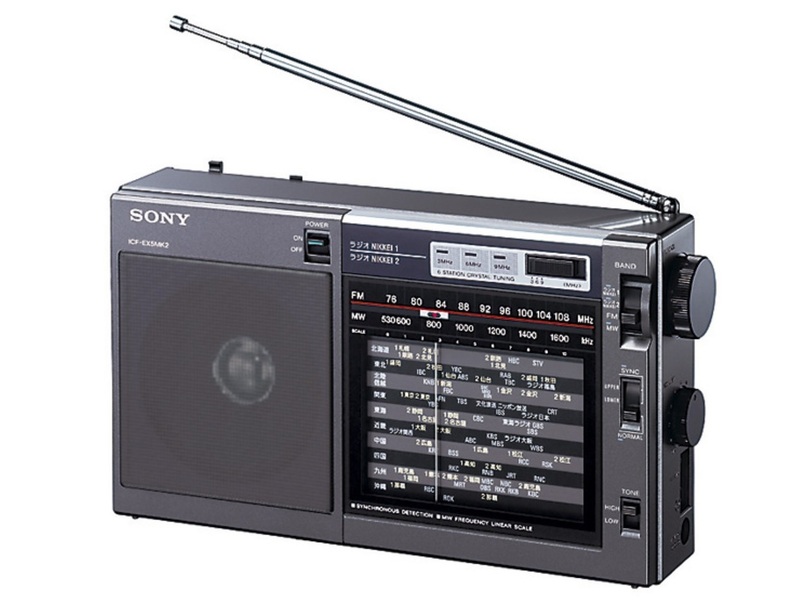 If you put the radio up high enough on the dash away from the roof of the car, and you were not too far from the station to receive their signal….well you might get some music. I said you might. And that’s the way it was in 1959-60. No car radio…just a small pink Zenith transistor radio. What abuse for a teenager…would you not agree? Can you imagine kids today suffering such abuse. Hard the realize it will have been seventeen years…..sad..
As I said, I liked Payne for reasons other than his ability to hit a golf ball. I like the line about “Seeing your kids figure life out – that’s the best thing about being a parent.” Payne added, “I just hope they figure it out a lot quicker than their old man did.” I think many of us can identify with what Payne said. 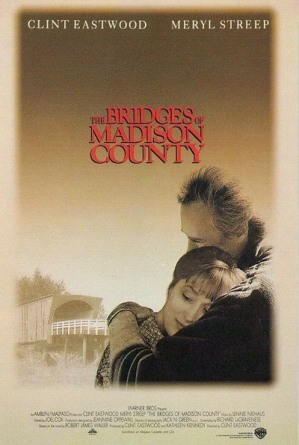 ​One of my all time favorite books and also movies is Robert James Waller’s book, The Bridges of Madison County. It is one of the very few books or movies that I watch or read again. And again…. She left me with more …..than I left her……..hum..Ever felt like someone left more of them with/on you……… than you with them? Recently in reading her book I was taken by the number of things that so many towns, communities of the 1950s’ had in common. Holly and Peggy Sue grew up in the west Texas town of Lubbock. In that town there was the Hi-D-Ho drive-in restaurant. Every town of any size in American especially during this time had such places. The movie “American Graffiti helped give credence to the popularity of such places in the lives of kids from the late 1950s’. A number scenes took place at Mel’s Diner. As I read that paragraph I thought back to my growing up days. The “strip,” well that was Wabash Avenue in Terre Haute, Indiana. The Hi-D-Ho’s for our generation would have been O’Days, TheTrianon and last on the strip, Henri’s. My mother came from a family of four boys with she being the only girl. In 1950 when her dad died, her mother, my Grandma McCammon came to live with us. She did for the next ten years and she died on the night of my high school graduation May 1960. Grandma had a lot of sayings she often laid on me. She had a lot of wisdom. Now days often when I walk into one of Nashville’s “establishment of entertainment and culture” I am reminded of one of her statements that is below. Chuck Berry turns ninety this October 18th. Born October 18th 1926. Rock on Chuck…if this video doesn’t do something for you…stick a fork in you…you’re done…you have passed over to the other side…. Jerry Lee Lewis once called him the “Hank Williams of rock-n’- roll.” He was referring to Chuck Berry, his song writing and performing talents. Over the years I have seen Chuck Berry numerous times; even once saw him in prison. Now, that’s a story for another time. The next Wednesday saw my friend and I and a bunch of other folks packed like sardines in a can in the basement of a small club in the heart of St. Louis. We were there to see eighty-six year old Chuck Berry do his thing. And do his thing he did! Now he is not the Chuck Berry of our 1950s’ days as his son and daughter helped him with various things while he was on stage. At times the lyrics seem to fade a bit and he still does an abbreviated duck walk; but he is still Chuck Berry. Yes, I do reminisce about the days of old and about a lot of people, places and happenings from that time. I do so more than often. You?